Photo courtesy of Aaron Dods. A lot better than having a sad. All our other Dwarves are sold out. For those who can’t wait, get an impatient at the cashier. I got a happy last week. Now I need a penicillin. 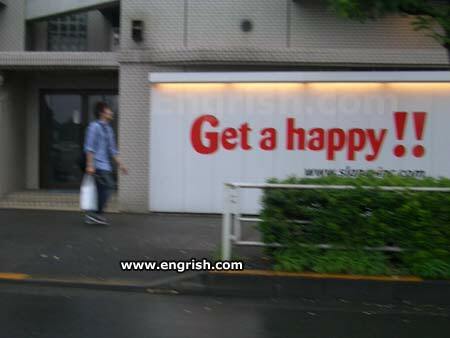 And by “happy,” you mean “beer,” right? All the individual Happy are sold out. We have only the package of four left. Happiness is getting materialized now. Its service with a smile! Hmm, I wonder if this massage parlor gives…. Oh, I guess it does. Shirley Jones and Danny Bonaduce are still questioning the wisdom of expanding into Japan. The pharmaceutical company felt that in dark times, it was better to promote their anti-depressants. Talk to your doctor today about Viagra. Free with the purchase of a Sneezy and a Doc. I’m all stocked up on “Happy.” Please let me know when the “Get a Clue” sale is on, as I have a number of gifts I need to get. No money? That’s alright… the first one is free. And they said you couldn’t buy happiness..
Happiness – Now in bottles! No, no I don’t need a bag. I’d like that happy in my pants, please. Does this mean take pills, or get religion? Hey! This happy is crappy, I want my money back. Last time I got a happy, peopre stared. I’ve got a happy right now. Do you want that with a side of grumpy, sad, or excited? As soon as I sell my sad. I wonder if “happy” is like “nice day”? They tell us to have one of them every time we check out! Thing is, they never tell you WHERE to get these things! It just makes me sad and frustrated all day long! I don’t need to get a happy. I steal everyone else’s happies. I wasn’t happy with my happy. Only lasts for 2 minutes. See your nearby doctor for details. Buy a happy, get a birthday for free! No, I’ll get a rich.